Forget the dark, enchanted forest. Picture instead a masterfully evoked Old West where you are more likely to find coyotes as the seven dwarves. Insert into this scene a plain-spoken, appealing narrator who relates the history of our heroine�s parents�a Nevada silver baron who forced the Crow people to give up one of their most beautiful daughters, Gun That Sings, in marriage to him. Although her mother�s life ended as hers began, so begins a remarkable tale: equal parts heartbreak and strength. This girl has been born into a world with no place for a half-native, half-white child. After being hidden for years, a very wicked stepmother finally gifts her with the name Snow White, referring to the pale skin she will never have. 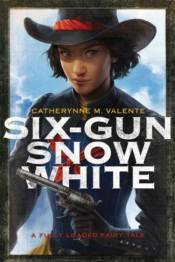 Filled with fascinating glimpses through the fabled looking glass and a close-up look at hard living in the gritty gun-slinging West, this is an utterly enchanting story�at once familiar and entirely new.